This beauty fair happening Oct 9, 2009(Friday) till Oct 12, 2009(Monday) at PWTC, only Saturday and Sunday’s fair is open for public, last year’s fair is held entirely on weekday, but this year is happening over weekend… yay… entrance is RM10 for non beauty professionals. the liquid wax to the left if for armpit etc, places which can’t be reached by the roller wax gadget in previous photo, the above wax heating machine cost about RM900, able to hold a wax container, and 3 wax roller gadgets. body sculpting wear by Lytess from France, the black one on the left cost RM500-RM600, so expensive! the package, claim to anti cellulite/anti-orange peel, has micro rubbing fabric knitting which patented technology works as it rubs against your skin. quality mask product from Sensoieur France, it is mask in power form. 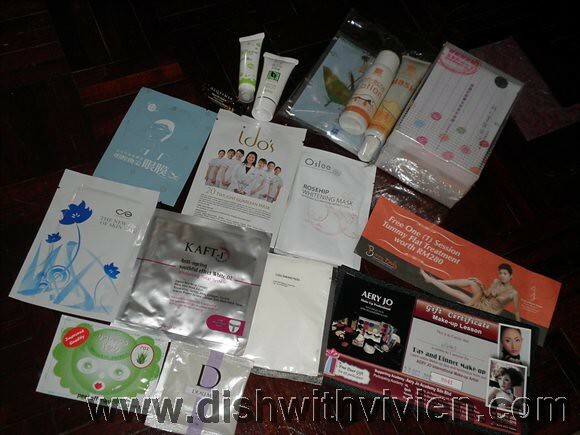 Taiwan’s Organic beauty bank selling beauty products. Dr Oasis which is kinda cool product, its motto is “The Power of Water” i find it is a mild skincare product but still does its job in cleansing, remove dead cells really well, its eye mask is selling for RM150, original price RM300, all the products is 50% off in this beauty fair, hydrating cleansing milk(RM170) really does remove surface dead skin cells. Dermadex, a well known beauty house which source for all the good skin care products around the world. nnail art diamontes, studs and other sparkly stuff, only RM1 each. This is pprobably the cheapest nail art bin here… haha… others selling for 3 for RM5, o1 for RM5.90 etc. and the RM4 backdated chinese fashion mags which got me lots of free stuff: la senze thong, more than 20 sachets of Lancome UV cream, 2 packs of lucidol rollers, body mist from ginvera and 2 bottles of wet tissue. Kiehl’s is an American brand that made landing in Malaysia just this past year (i think), first flagship store in Pavillion and currently they have a store in MidValley Shopping Center, ground floor (near Vincci shoe store). I was looking for moisturiser for the face, and they recommended me 4 choices, and gave me 4 samples(2 are made from Yerba Mate(green colored packets) and 2 others). Skincare, healthcare, health supplements are probably the most profitable business of all, i mean how do i ever knows it works, and even that i have to spend so much to find out… especially skincare, with all the claims of certain products, and promises to reduce dark circles, fine lines, it is like does it really work… who knows it is just some beautiful words to pander to every girls dream to be young and beautiful.